NOTE: As always, click on a picture to enlarge it. 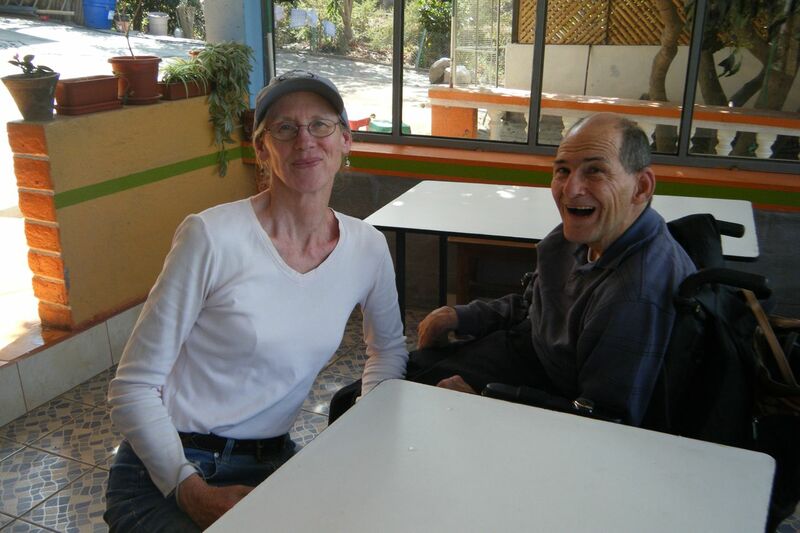 Pat Billings is another of our longtime friends who has decided to make the trek to beautiful Ecuador to visit us. We met Pat shortly after we were married. Pat was on a Morris dance team that Marilyn joined in Houston 28 years ago. Over the years, we became good friends and really came to value Pat's no-nonsense tell-it-like-it-is observations. Pat was supposed to arrive at 11:17 pm. We got to the the airport at 11:30 pm. Pat had actually arrived at 11:00 pm. We didn't see her plane listed and got worried. However, she emerged from customs five minutes later. That was definitely the fastest airport pickup we've ever experienced in Quito. We wisked Pat off to Blanca and Luis’ condo for the night. Isabel, Victoria, and Brayan had come with us too because our plans for the following day included a trip to the cloud forest near Mindo, where they had never been before. We allowed Brayan to miss a day of school as we felt the experience would be educational and he loves science. When Pat arrived, I was a scruffy mess. My electric shaver had completely given up the ghost a week earlier. I'm sure it's not impossible to find electric shavers in Ecuador, but I've never seen any for sale - anywhere. So I asked Pat to bring a shaver. Luis, Blanca's husband, had been kind enough to loan me a safety razor, but I gave up on it after using it once. My beard is just used to an electric shaver. I shaved that night, even though it was almost midnight when we got home. Since Pat started celebrating her half-birthdays last year, and since she arrived on her 71st and a half birthday, Marilyn made a coffee cake and brought it to Luis and Blanca's. At breakfast the next day, we decorated it with candles and sang Happy Birthday to Pat. It was a pretty big party because Brayan, Victoria, and Isabel were with us, too. Even though Marilyn, Pat, and I talked almost an hour before going to sleep the night before, we got up, ate breakfast, and left for Las Gralarias, a nature reserve in a cloud forest, by 10 minutes to 9:00 am. The drive to Las Gralarias was faster than expected. I had been a little worried about the last 3.5 kilometers of dirt road because Jane Lyons had written in an email that a 4x4 was preferable. It had also rained the past two days. I pictured a muddy road with deep ruts. The road was fine, however. I thought we had gone too far because I didn't add 3.5 kilometers to our mileage at the turn-off correctly. Luckily, we couldn't turn around, kept going, and found Las Gralarias. There are no signs, probably because drop-ins to the hostal and reserve are not particularly wanted. Pat met Jane Lyons almost immediately, as did the rest of us. The two fell into an old acquaintanceship easily, talking about mutual friends and shared experiences. They hadn't seen each other for years. Everyone except Victoria and I went for a hike before lunch, led by Tim, a guide from England. Victoria and I were kept company by Vicky, another guide from England. Tim and Vicky are a couple. They both did work for their Master's theses at Las Gralarias. After school, they decided to work at Las Gralarias for a while before going back to England to pursue Ph. D.'s. Victoria and I saw lots of hummingbirds while sitting on the porch. 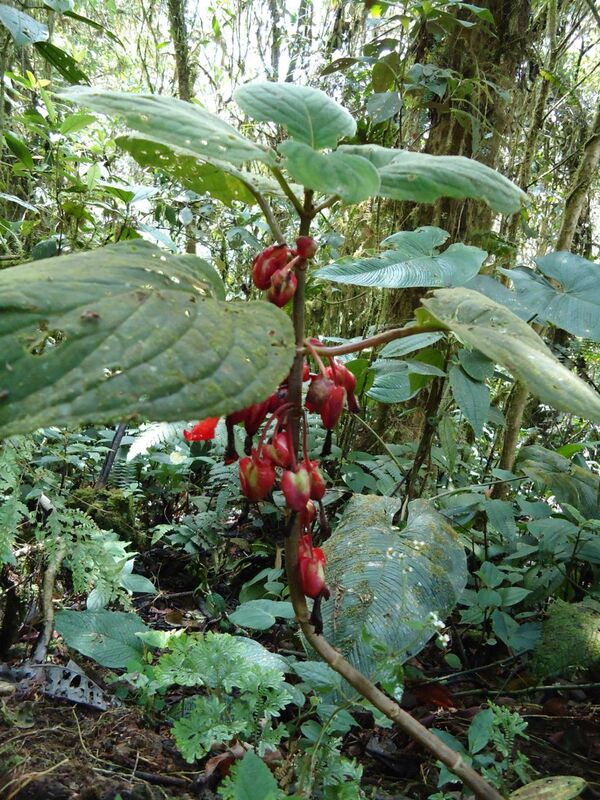 Vicky said that there are 27 species that frequent Las Gralarias. 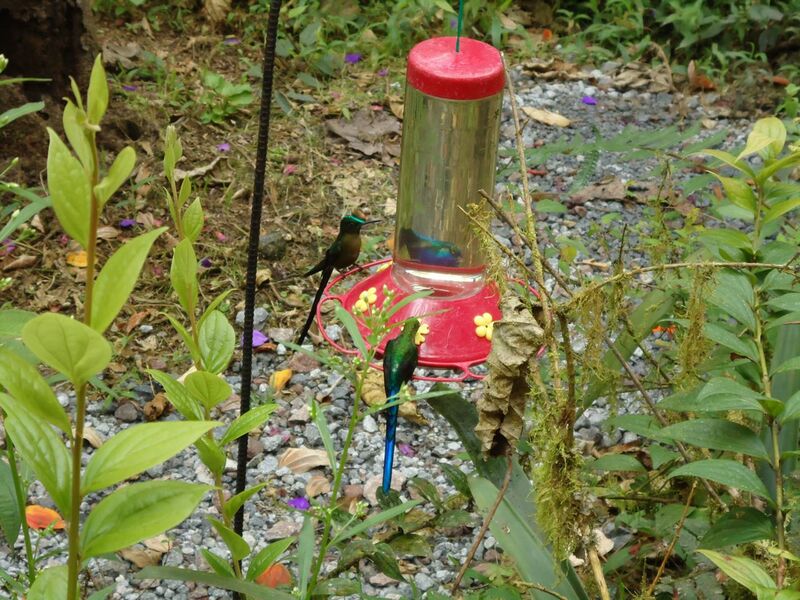 I also saw a Flower Piercer and a Mountain Tanager. A Gralaria is a species of bird. Vicky described it's appearance to me as sort of like a potato on sticks. Vicky had a lot of patience in trying to understand my side of the conversation. Meanwhile, the rest were having a great hike with Tim. He not only looked for birds and butterflies to show them, but also described different plants and how the animals interacted with them. Jane Lyons, a woman Pat met in Austin, bought the property (a little more than a thousand acres) and set up the nature reserve Las Gralarias. She also set up a foundation so that the work will continue after she's gone. It attracted birders from all over the world, but primarily from the United States. It attracted so many, in fact, that she decided to build an ecologically friendly hostal, or hotel, (though she never had the intention of getting into the hospitality business). 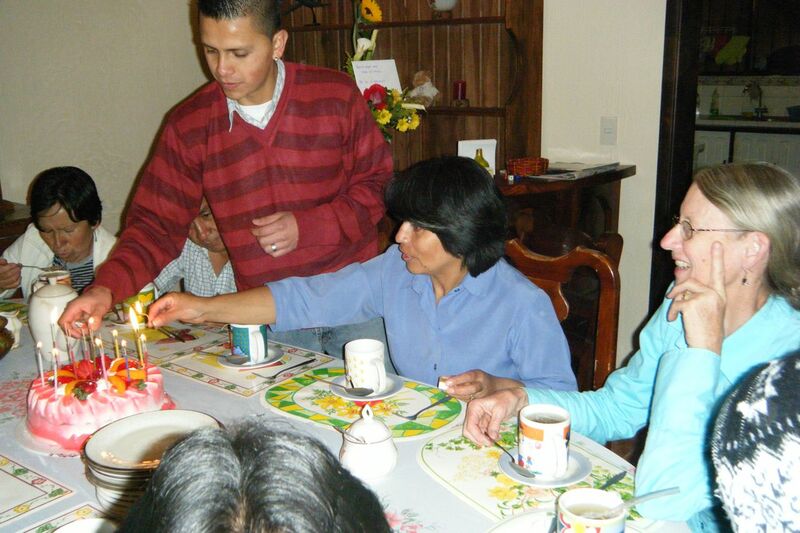 After a very nice lunch at the hostal, we drove Blanca and Luis back to their house in Quito. 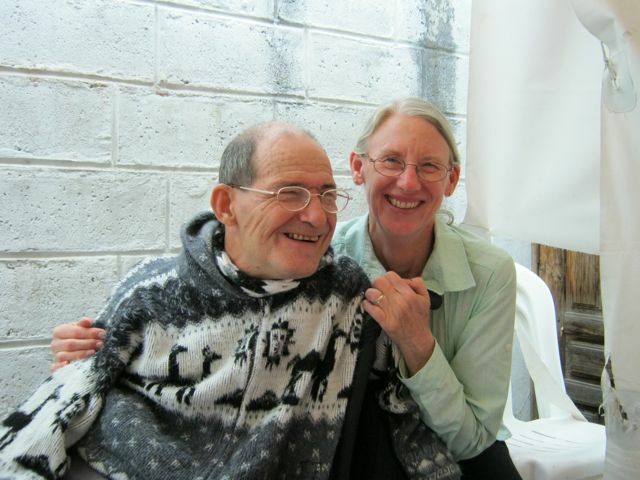 Then we drove on to our house in Otavalo. We just had to stop in Tabacundo for Pan de Yuca (bread nade with yuca) so Pat could try it. Even without the excuse of a visitor, we can hardly get through Tabacundo without stopping for Pan de Yuca, especially on the way home. We love that stuff! After café, Pat became the first guest in our newly built guest room in the bodega (a separate building on the property). Isabel, Cesar, and Luz had helped us get it together. We loaned Pat my phone in case she needed to get into the main house while it was still locked at night. Good thing we thought of lending her that cell phone! Pat called early the next morning. She couldn't get out of her room. Canela (our dog) had tried to get in to "visit". When she did, she accidentally locked the door from the outside. 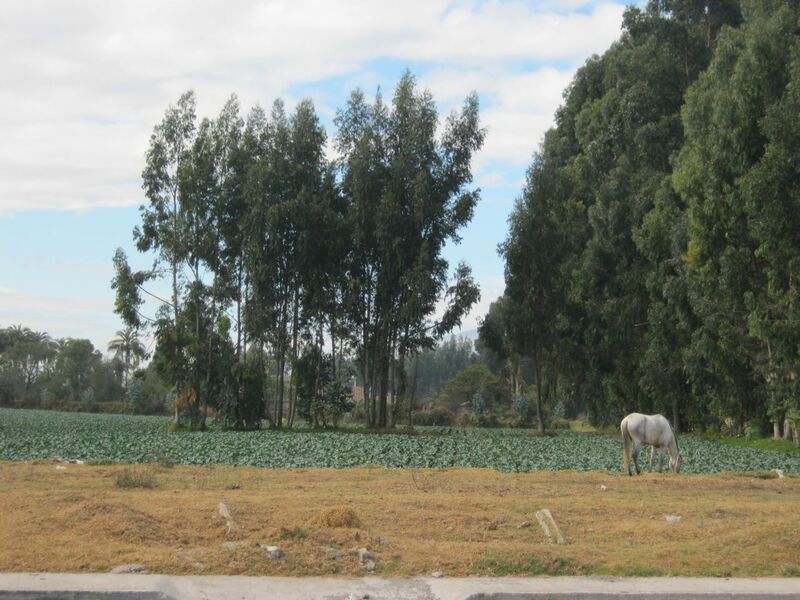 There were a couple of unusual things we saw when we showed Pat around downtown Otavalo on Thursday. A funeral mass was just ending when we got to San Luis, the cathedral. We stood to the side as the mourners left bearing the casket, displaying many, many flowers as they passed. When we showed her a fruit and vegetable market, a man was there with two or three goats selling fresh "squeezed" goat's milk straight from the udder. We'd never seen that before. 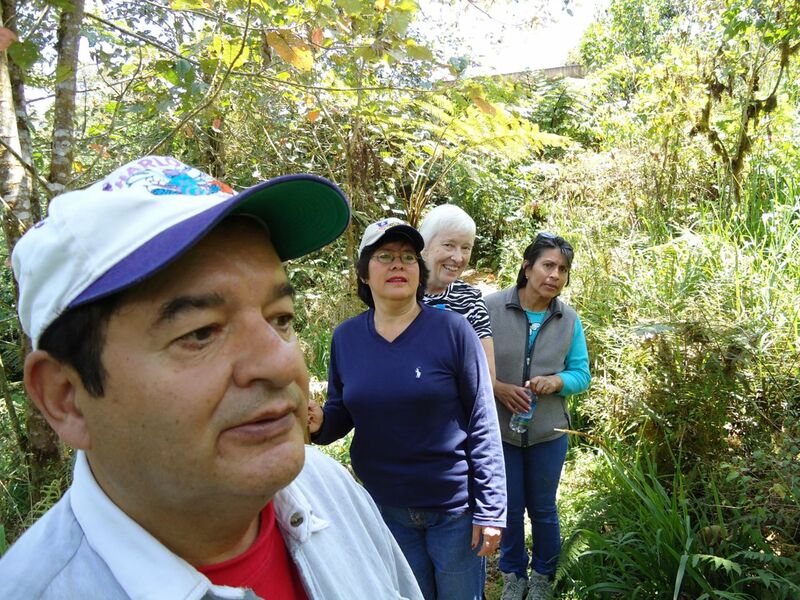 Following lunch, Marilyn, Pat, Isabel, and Brayan hiked to Cascada de Peguche, one of our favorite attractions around Otavalo. 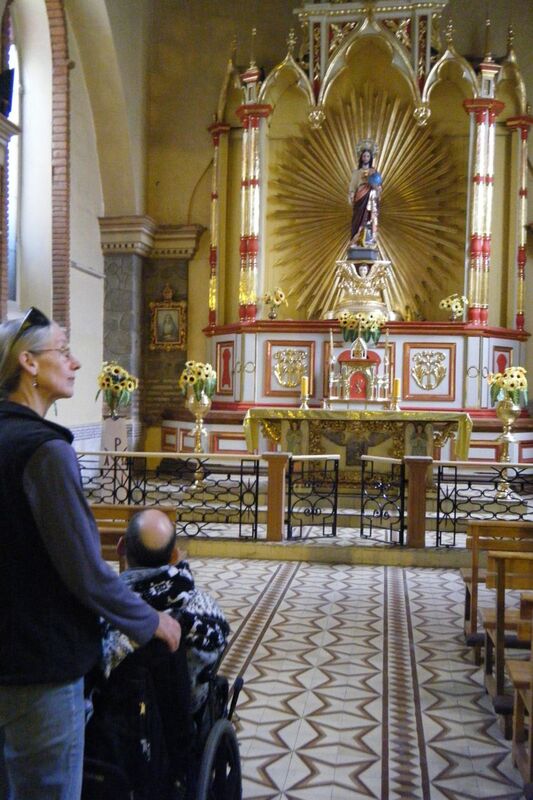 When we had had breakfast on Friday, we went to San Antonio de Ibarra so Pat could see the things carved out of wood. She's less of a consumer than we are (in fact, way less), but she was interested in seeing the carvings anyhow. I, on the other hand, bought a set of three corner accent tables because I had long wanted a table in the office so I could have freshly cut roses, AWAY FROM THE COMPUTERS. (We had a little accident about six months ago, with water getting in a computer from a spilled vase of roses.) With Isabel's help, I decided I'd put one in the office for the roses, one in the living room, and one in the guest room. After lunch, Isabel had to go to Brayan's school for a meeting with his teacher. 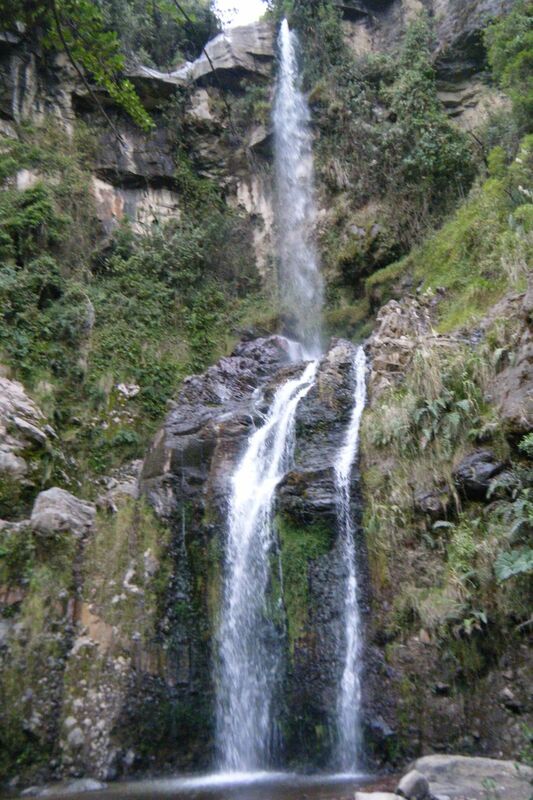 When she was through, we picked her up and went to Cascada de Taxopamba, on the road to Laguna Mojanda. Marilyn and Isabel had "discovered" this waterfall a while ago, but had only recently made it all the way to the waterfall because the trail had finally dried out. They encountered some fallen trees and a couple of those hiking decided they didn't want to go any farther. However, those people were encouraged by the others to press on. The two, including Pat, were rewarded with a beautiful waterfall. 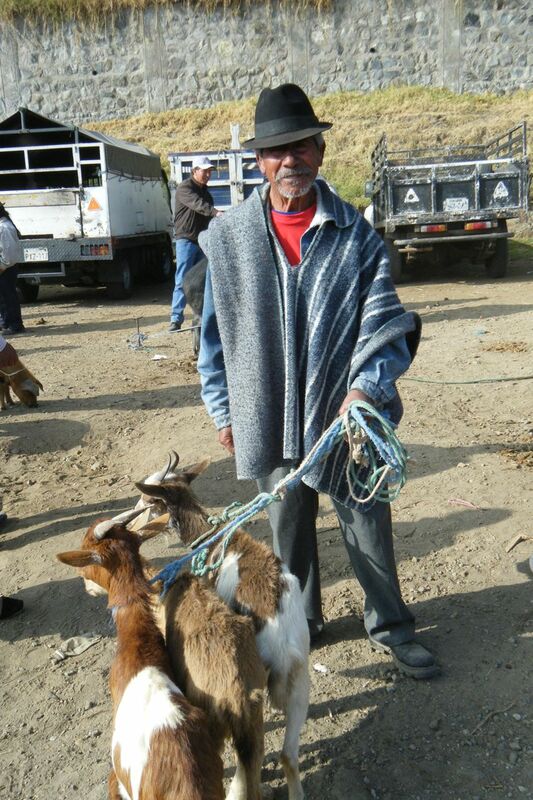 Marilyn, Pat, and Brayan went to the animal market Saturday morning at 7:30 am. The night before, I told Brayan in front of Isabel to get me a kitten, just to see her frown. Marilyn said she wanted a conejo (rabbit). Brayan said he wanted a chanchito (piglet). Isabel was not amused. In the afternoon, we went to the archaeological museum in Ibarra. Everyone, including Pat, enjoyed it. The quality is so good that it's hard for me to believe that it's free. We went straight to our favorite tilapia restaurant before going to San Miguel Arcangel because we were starved. Seven of us ate tilapia for about $20. When we did get to San Miguel Arcangel (a statue of St. Michael the Arcangel high above Ibarra), there were many more people there than usual. The gates were closed, so we couldn't drive in. But we were able to park nearby and walk in. The next day we read in the newspaper that there had been a caminata (pilgrimage) to San Miguel Arcangel. Sunday was a little different, as far as showing visitors around, but it still involved some sightseeing. At 8:30 am, eleven of us went to Quito. A mass was being said for Victoria's sister, who died about a month ago. It was being said in San Francisco church, the only one of the major churches in Quito neither Marilyn nor I had been to. Besides Pat, our family, and Cesar's family, Yolanda and Carrollito came with us. Since the mass wasn't until 2:00 pm, we first went to the Panecillo, arriving just after 11:00 am. The entrance was blocked off by police because there was a mountain bike competition on the hill at 12:00 pm. Cesar did a good job of pleading, and we got permission to go up for 30 minutes. The weather was great, so the views were really spectacular. 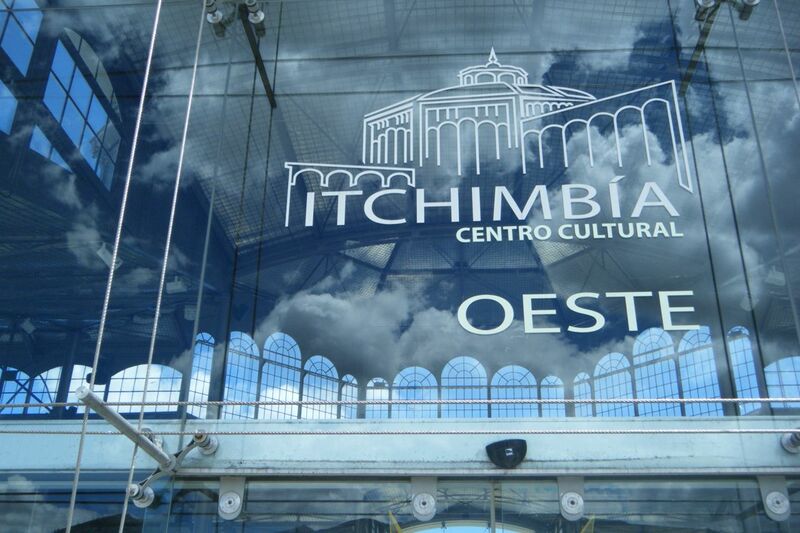 Next, we went to Parqué Itchimbía. When we got there, Marilyn and I realized we had been there with Carlos and Roberto (guides) when we vacationed in Ecuador in 2004 with Mary and George (friends). It has a crystal palace in which they have exhibitions. When we were there in 2004, there was an exhibition of archaeological artifacts. 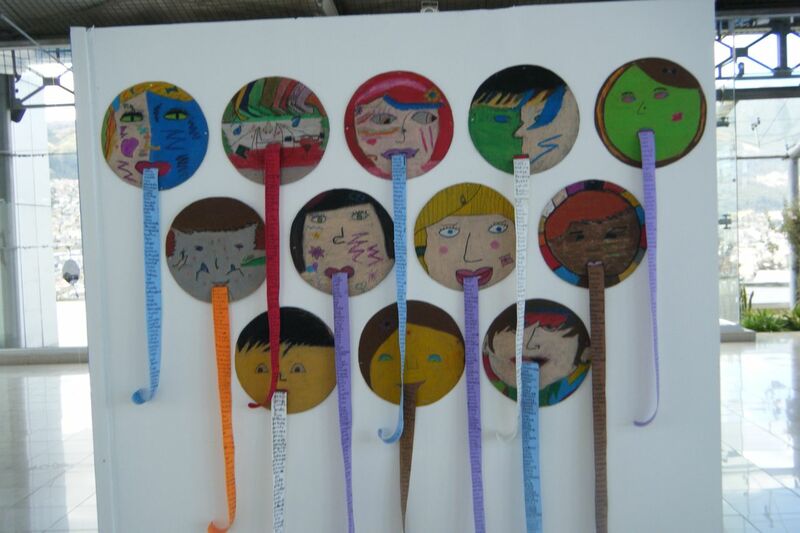 This time there was an exhibition of children's art. The building itself is really pretty, too. Before we went in, we had a picnic in the parking lot. After that, we went to the mass for Victoria's sister at San Francisco church. It was very ornate. The priest also spoke very clearly, but we still didn't understand too much. I think it may have been a nice closure for Victoria. When her sister died, she lamented that she was the only one left of six siblings. Margola Pasquel and Pilar Pasquel, some more of our extended family, came home with us. They hadn't wanted to leave as early as we did, so they had taken a bus to Quito. Both can drive, but neither likes to drive in Quito. I don't blame them. 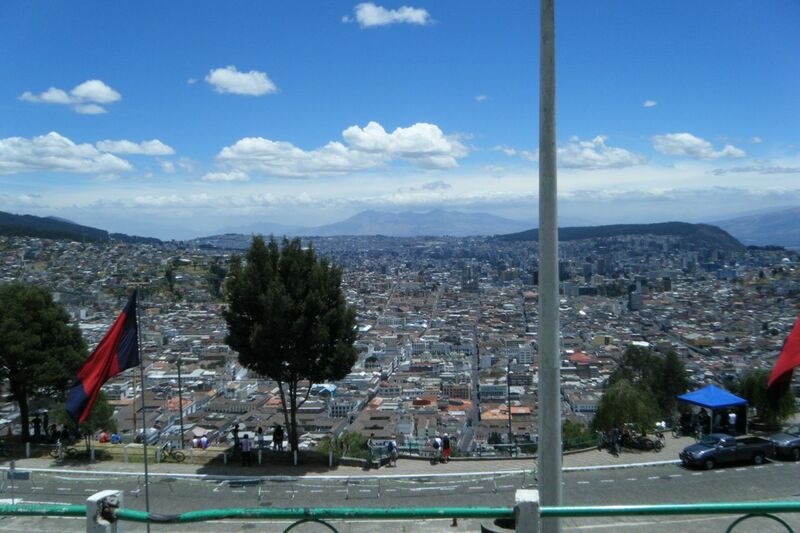 Driving in Quito can be quite nerve-wracking. It did mean that there were 13 people in our 12 passenger van on the way home, but that's nothing. When we let the family take Billy Bob to the funeral, they stuffed 18 people in there. Okay! Okay! So you're not that old!!! Once home, we had yet another birthday party for Isabel. I think we had five in all. This time, Elvis brought over a cake and flower arrangement. He also wrote some very nice things on the card he had gotten for his mother. We all had a good time. Pat suggested we name the house Casa Fiesta because we seem to have one fiesta after another. 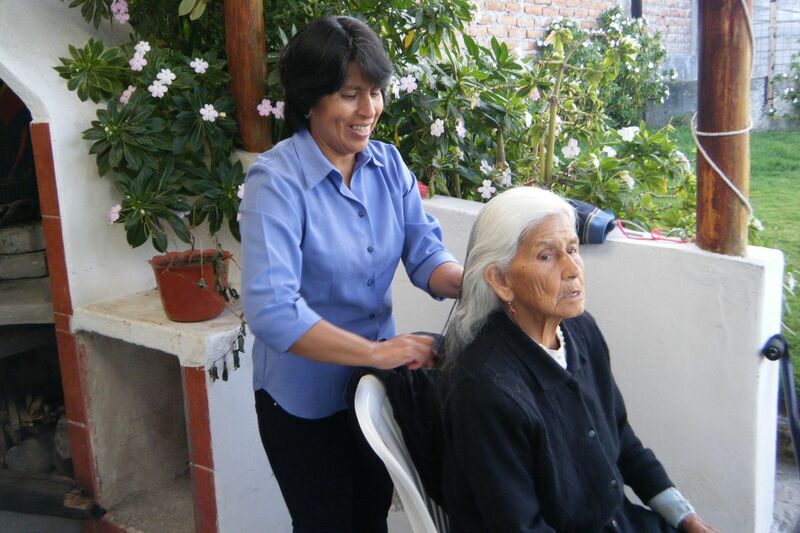 The last two days of Pat's visit in Otavalo were occupied by some of the usual tourist destinations. 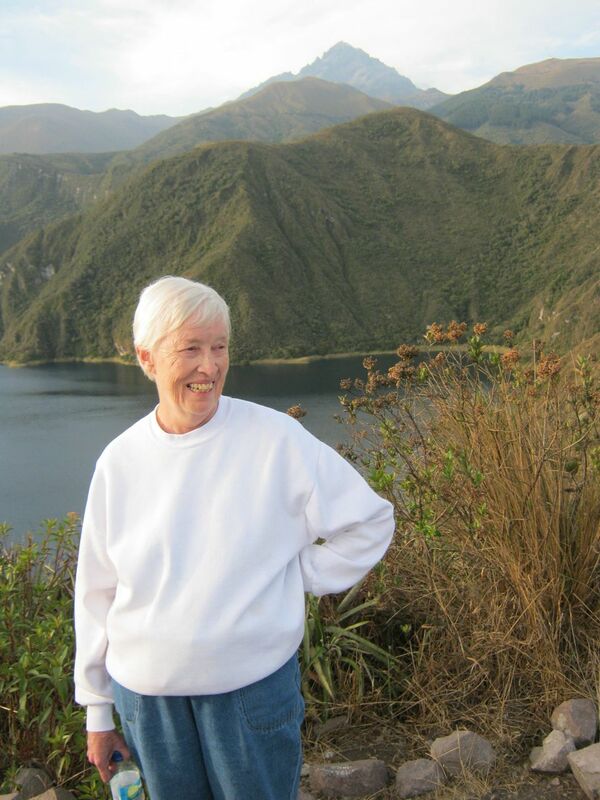 Marilyn took her for a hike around part of Lago Cuicocha on Monday, as well as squeezing in a quick visit to the leather town of Cotacachi. On Tuesday, they went hiking up at Lago Mojanda (about 10,500 ft). Another highlight of Monday was that Elvis took Isabel, Brayan, and Victoria to get haircuts. He's done this before with Isabel and Brayan, but never Victoria. In fact, 87-year-old Victoria had never had her hair cut. I had always assumed that it was very long and I could never see it because it was balled up somehow under the scarves she wears. Pat and Marilyn told me it wasn't that long. We asked Isabel why it was not very long, since it had never been cut. She said it used to be braided down to her waist. However, when she had radiation treatment for cancer 30 or so years ago, it all fell out and grew back very slowly. Marilyn told Victoria she looked 70 instead of 87 with her short hair, and she really did! She got a kick out of everyone fawning over her new "do". Marilyn wasn't teaching while Pat was here, so Pat didn't get to see her in action with the little children. 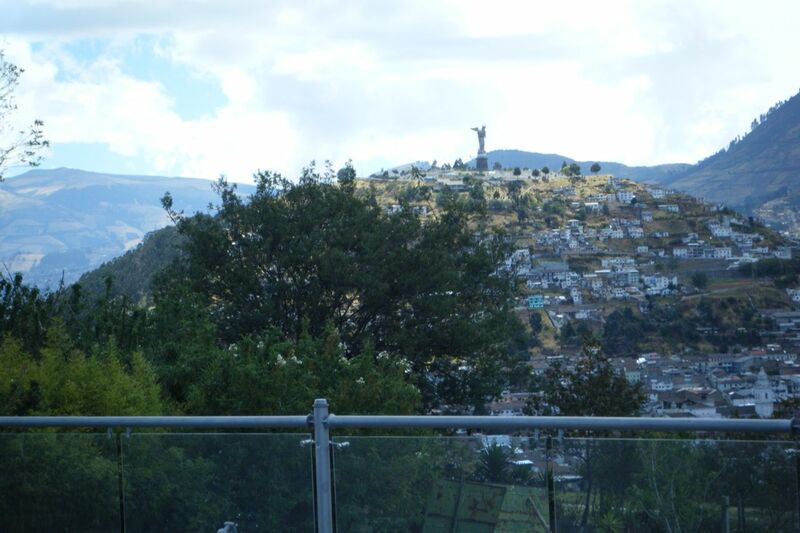 However, the day before Pat was due to fly back to Houston, we left at 7:45 am for the FEDICE monthly meeting in Quito. Pat got up early so she could say goodbye to Brayan before he left for school at 6:25 am. She also made sure to say goodbye to Victoria, too, who wasn't up by the time we left. When the meeting broke for lunch, Pat, Marilyn, and I went our own way with the understanding that we wouldn't be back for the afternoon session. Pat wanted to take us out for lunch before she left. We settled on the El Coyote mexican restaurant. It's not the same as Chuy's in Houston or Austin, but it's pretty good, despite not being very spicy. Andean Ecuadorians are not very fond of spicy foods. A restaurant has to play to it's audience, although I know that not all mexican food is spicy. We went to the Jardín Botánico (botanical gardens) in Parqué Carolina after lunch. Our favorite place was the orchid house. There were so many beautiful flowers! When we had walked around for a while, they started misting the orchids. Pretty soon it started raining - inside! That's a pretty neat way to water the orchids. Rather than continuing to get wet, we went outside to look at the cactuses. In a little while it was sprinkling there, too. By the time we got to the car and then to Luis and Blanca's house, it was raining pretty hard. 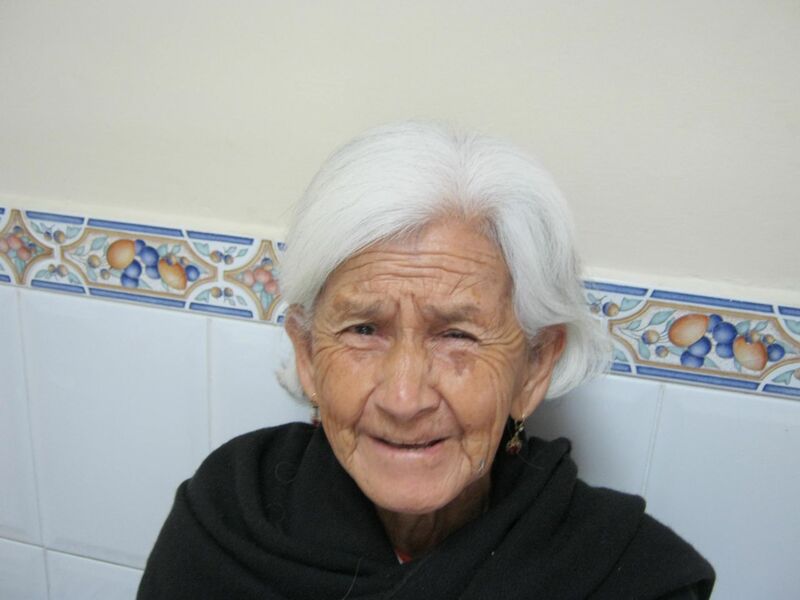 In fact, it has rained every day in Otavalo since Pat left us. As far as sightseeing, she had impeccable timing because she came and went home just before the rainy season. Pat also gave everyone in the house a gift when she said she hopes to return in two years. That warmed all hearts in the house. I just went to the site about the Reserve, and it looks wonderful! I´ll have to go visit there some day. I love watching the birds here at Victor´s house, and we only have about 6 or 8 different kinds. NOTE: As always, click on a photo to enlarge it. Would you want to go to San Francisco without a Golden Gate bridge? Without trolley cars? Without a Fisherman's Wharf, or Ghiradelli's chocolate, or clam chowder, or strange clothes, or wild hairdo's? Why would anyone want to go to San Francisco if it didn't have at least one of these things? Well, you might want to go if you had the chance to teach precious preschoolers a few sounds from the English language. Last year, at a monthly FEDICE meeting, Digna Chacha Pullopaxi, Vice-President of the Board of FEDICE, was in attendance. She was interested in what Marilyn had to report about her English teaching in the Caluquí preschool. When there was a break, she asked Marilyn if she could travel to San Francisco, south of Quito, and teach there. Marilyn of course said yes, provided a time could be found. In September, that time was found. 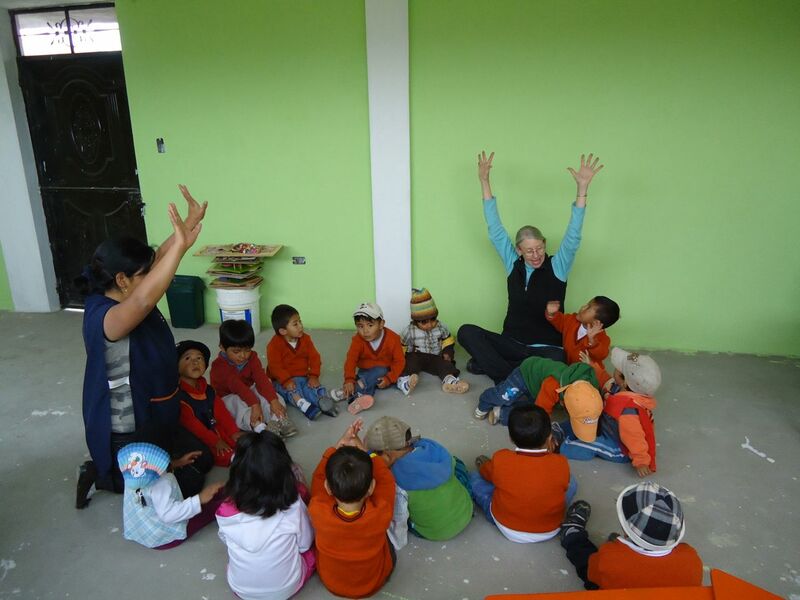 Due to various factors, Marilyn wouldn't begin her regular teaching duties in the communities near Otavalo until November. Perfect for traveling to San Francisco to teach some English classes. Of course, Glenn is part of the package people get when they ask Marilyn to travel these days. 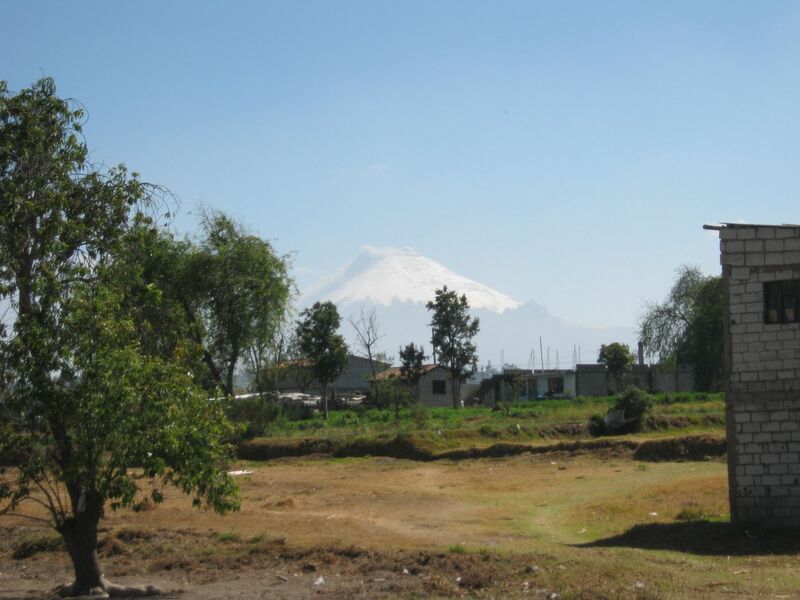 Digna is not only on FEDICE’s board of directors, but she’s a community leader in her own small town of San Francisco, a suburb of Latacunga, which is south of Quito. When she saw the need for a preschool, she converted the downstairs of her two story home into a preschool and her yard space into a playground. 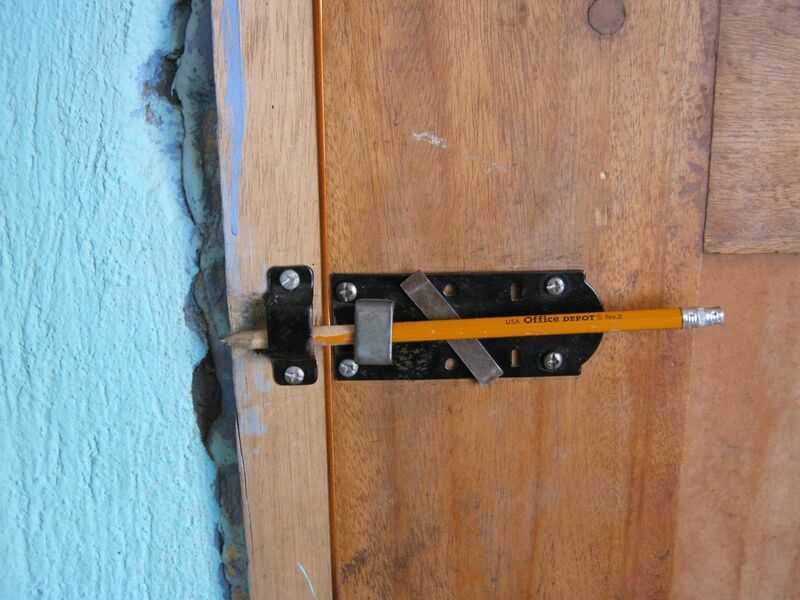 Fortunately, the community, local government, and FEDICE are helping to construct a new preschool which will probably be completed by early next year if money can be found to purchase windows and doors and to pay the workers. Our drive south of Quito was on what is called the Avenida de los Vulcanes. We’ve been this route several times before but never got to see much in the way of volcanoes. It was always cloudy or overcast. This time we were heralded by views of several of the volcanoes, including the best closeup views of Cotopaxi Volcano that we've ever had. 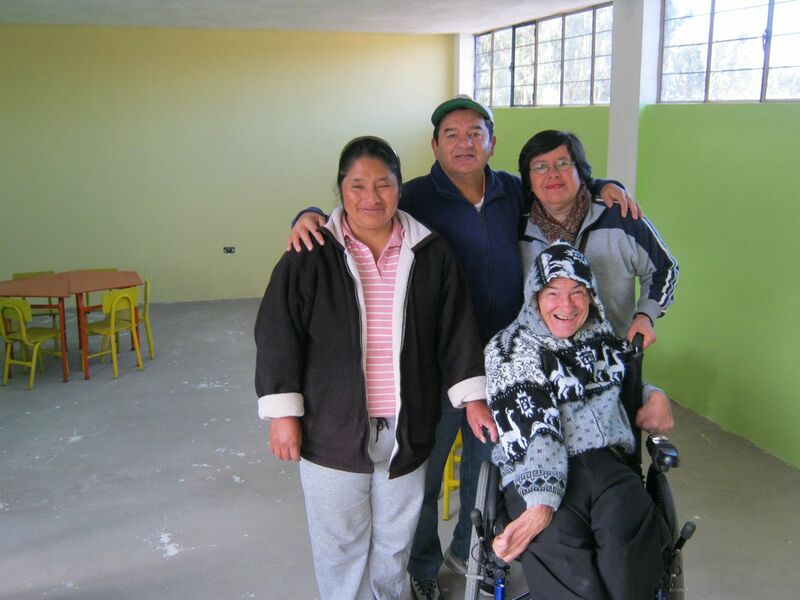 Digna and her husband, Amable, gave us two rooms that had previously been used for the preschool. It was hard to believe, and pretty humbling, that the two of us were taking up the same space that had only recently accommodated 20 to 30 children. They were just setting up our bed in one of the rooms when we arrived. The room where we would sleep had a light, but no electrical outlets because of the children. The other room, which we decided to use for our office, had no electrical outlets and no light except daylight from the window. 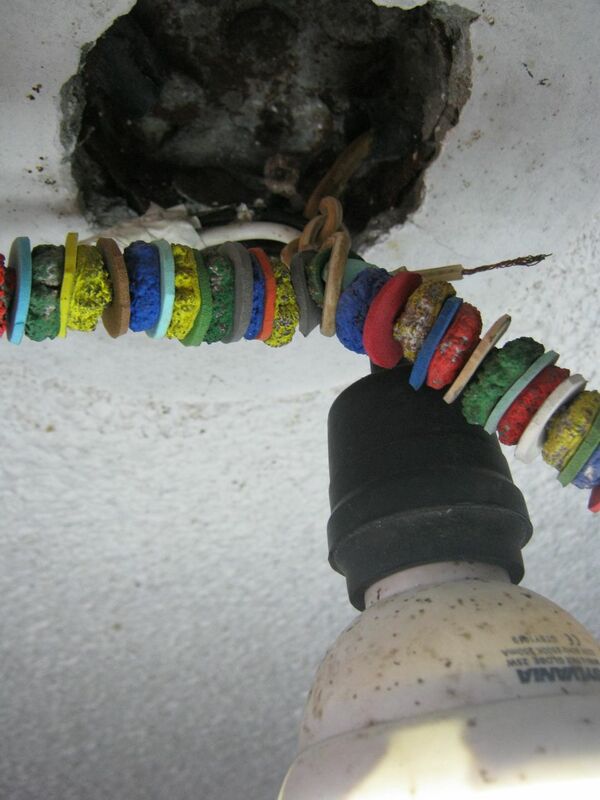 The first order of business for Amable was to string an extension cord from upstairs to the room's ceiling and attach a lightbulb. He told us to just call him when we needed the light turned out at night. But we soon learned that Marilyn could simply unscrew the lightbulb when we needed it turned off. That's an advantage of being tall. The second order of business was to set up a table at the right height, or close to the right height, so Glenn could use his computer comfortably. Naturally, they didn't have one ready-made. After all, we had had the one Glenn uses at home custom-made. But they did have two metal sawhorse-like things, which they laid a piece of plywood over. When this wasn't high enough, they stacked two-by-sixes on top and put another piece of plywood on top of that. Actually, it was Marilyn's idea to put the two-by-sixes between the two sheets of plywood. Pretty good for someone who doesn't consider herself handy. They also strung another extension cord from upstairs so we could plug in our power strip. Voila! We had a desk big enough for both our computers and the printer, and high enough for Glenn to use comfortably. It always amazes us how creative people are here. They can figure out how to solve problems like it's an innate skill. And they often come up with solutions very rapidly. 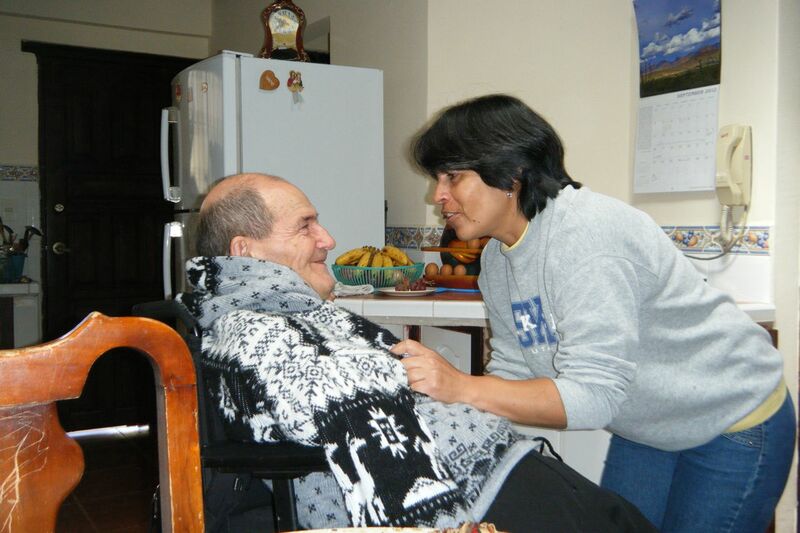 Amable was introduced to Glenn as Digna's husband, since he already knew Digna. When Glenn asked him what his name was and he said Amable (which means friendly), Glenn immediately replied, "Me llama Allegre," (which means, "Call me Happy.") Everyone, including Amable, enjoyed that joke. We soon went to bed, surrounded by pictures and drawings you would expect to see on the walls in a preschool - animals, plants, letters, and numbers. 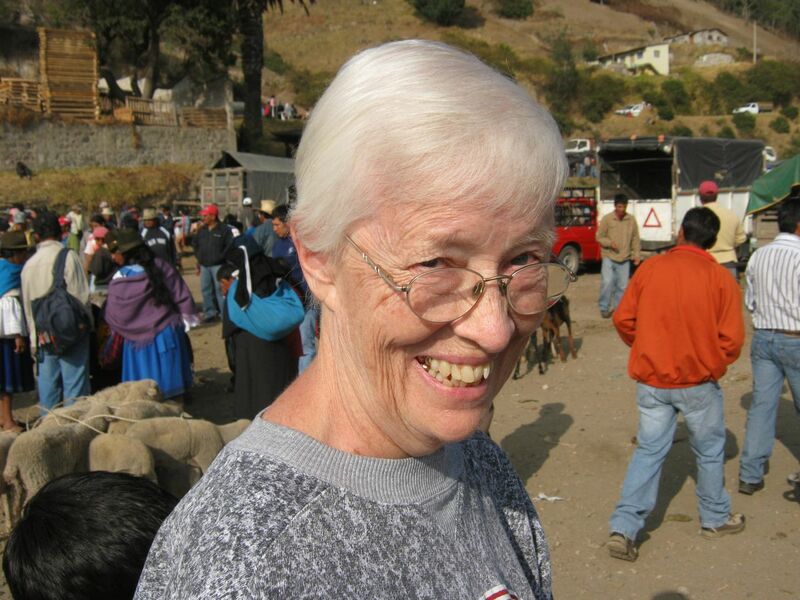 Originally, Marilyn was going to teach for two weeks, with us returning to Otavalo on the weekend between, but circumstances dictated only one week. Throughout the week, Marilyn taught four classes per day. The two morning classes were for preschool students. 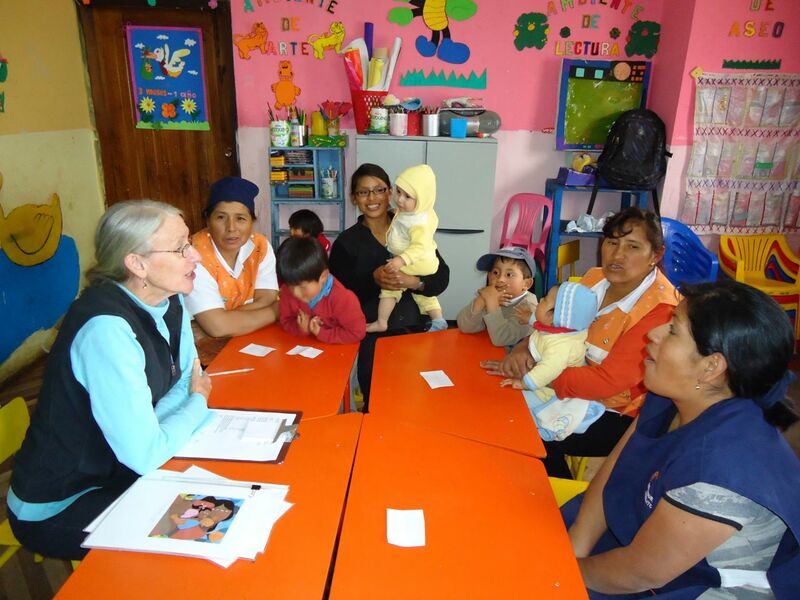 In the afternoon, she taught a one-hour class to the preschool teachers and a two-hour class to local elementary school children who were siblings of preschool students and who had signed up when it was advertised that an extranjera (foreigner) would be available to teach English. The idea of teaching the preschool teachers was a simple one. 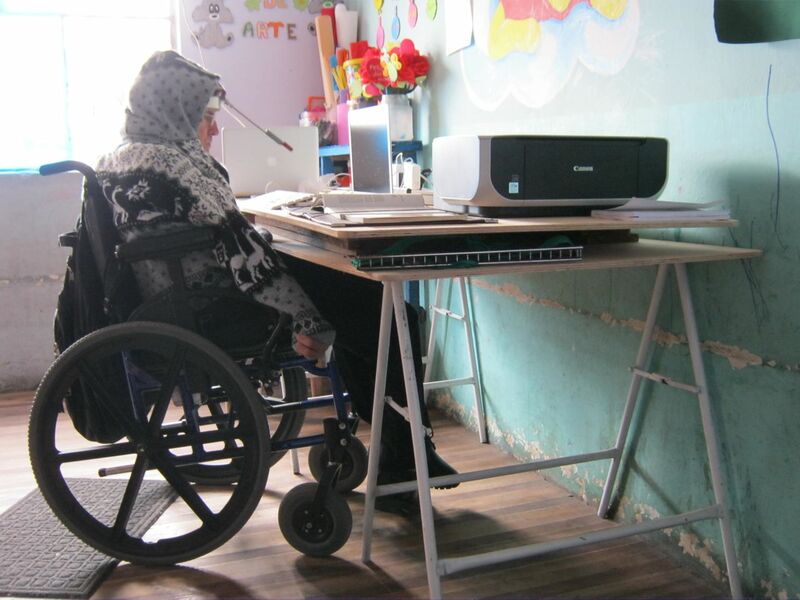 After Marilyn left, the teachers would be able to reinforce what she had taught the children. She would also leave reference materials with them covering all the classes she taught the teachers. The first class of the day was with the older preschoolers, 3 to 5 years old. There were two girls. The rest were boys. Marilyn said they were a handful, but Annabelle, the teacher with her, was a lot of help in keeping them under control. This class was taught in the one completed classroom of the new preschool being built across the street. The second class was at 11:00 am. It was with the little children, most of whom weren't even talking yet. But they got to hear some English! They liked the songs a lot. One day in this class, Marilyn held up a picture of a cow and one little girl said, "cow." It probably was not her first word, but it may have been the first word she spoke in the preschool English class. Both Carmen (the regular teacher) and Marilyn had huge smiles on their faces. Marilyn said she had never had an adult class that showed as much enthusiasm for learning English as the class of preschool teachers she taught at 2:00 pm. She thought Digna had done a great job of paving the way for her classes. The last class of the day was from 3:00 to 5:00. It was made up of about ten children from the local schools who ranged in age from five to thirteen. Marilyn said the age range wasn't too challenging, however, because all of the children were at about the same English skill level. Also, they had signed up because they really wanted to be there and thus were well behaved. On Wednesday night, when Digna brought us our café, we asked her to sit and talk with us for a while. Marilyn had had chances to go upstairs and talk with the family, but Glenn hadn't been able to talk with them much. Dayana, her three-year-old, stayed with Digna while we talked. Dayana was just a little intrigued by us. We noticed that Digna and Amable had at least two bodegas (separate buildings) on their property with people living in them, so Glenn asked just how many they had. She confirmed it was two. We assume the people in the bodegas pay rent. She said that the family in one is made up of migrant workers who are here to work the nearby plantations of broccoli and onions for about four months. 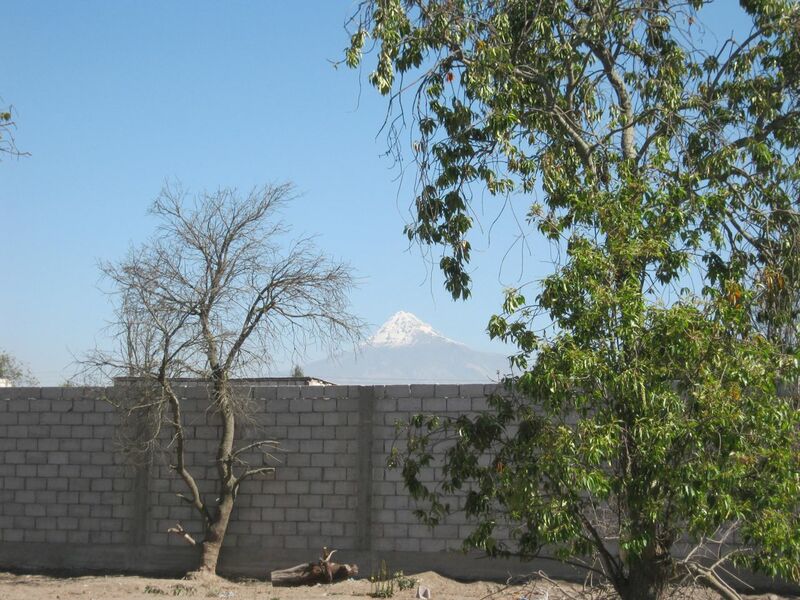 Digna also told us she had gone to Quito during the day to talk to some people about getting some money to pay the two men who are continuing to work on the new preschool. The people told her she'd have to wait. Trouble is, the workers have to eat, too. During the whole time Digna was talking with us, little Dayana was almost constantly crawling over her, pulling her hair, poking her here and there, pulling her blouse down to expose her breasts. Not once did Digna get frustrated or angry with Dayana. She obviously loves children. It's no wonder that she felt called upon to open a preschool in her home three years ago when the need arose. 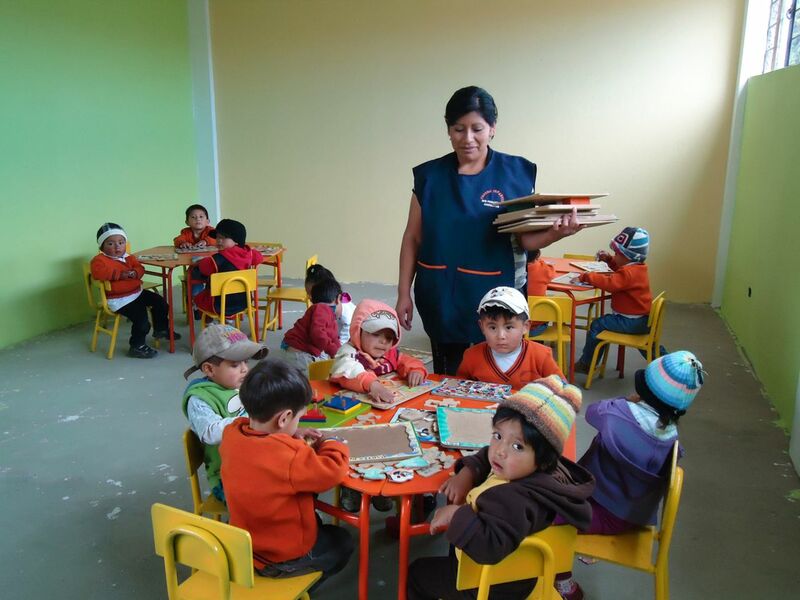 Digna told us that before the preschool in her house was opened, women were leaving their preschoolers at home with older siblings, the dogs and cats, and a bowl of food for the day while they went to work. We just can't imagine doing this, but people do what needs to be done, I guess. The elementary school children Marilyn taught had some experience with English at school. Throughout the week, they improved pronunciation, gained new vocabulary words, and practiced talking to each other. On the final day, their parents came for a small fiesta and to see their progress. It was a room full of the smiling faces of successful children and proud parents, as the children showed off what they had learned during the week. 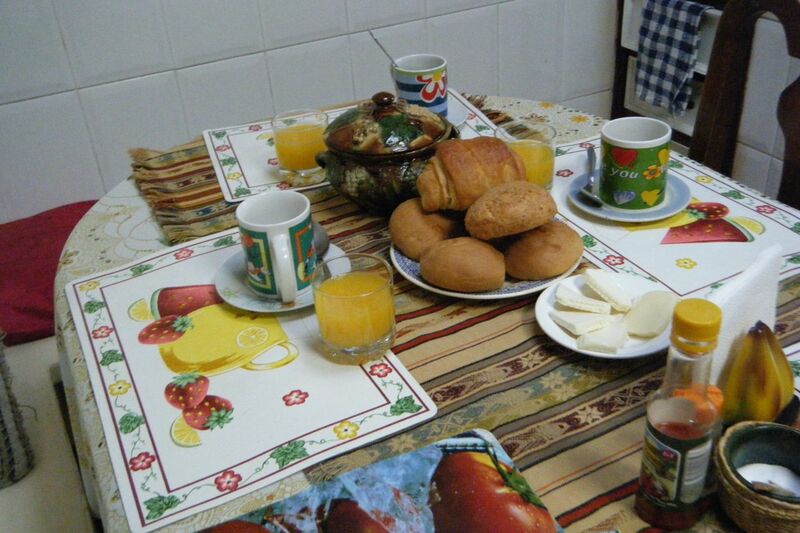 We hope to return in the spring of 2013 to the warm hospitality of Digna and Amable's house so Marilyn can teach more English classes to students eager to learn. 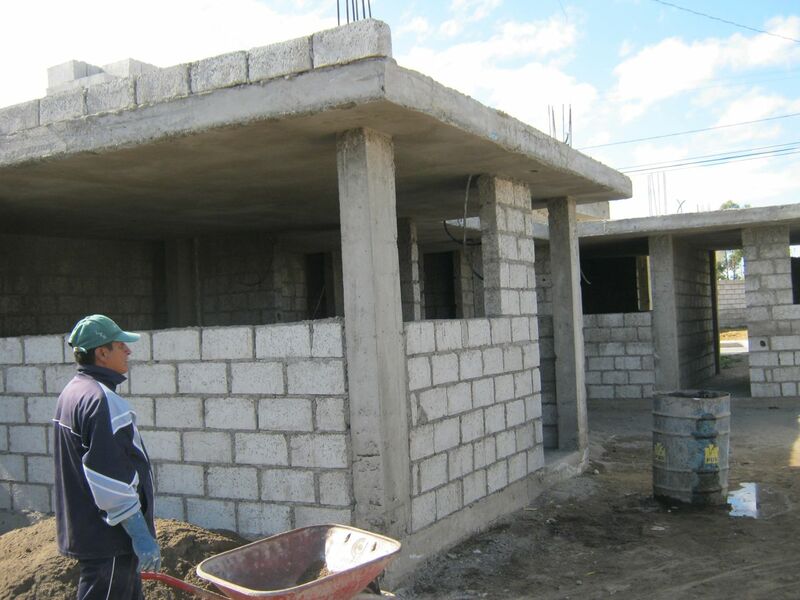 Meanwhile, the community and FEDICE are trying to raise funds to complete the new building so the rest of the students can move across the street and Digna can once again have full use of her two story home.